Create butterfly shapes from paper and color to resemble the decorated cake. Include all the party details and fold the butterfly and tuck inside a colorful envelope. Cut colored paper in butterfly shapes for invitations. Kids can glitter, stamp and sticker after the important when and where info is added. Or let kids explore on the computer to create and print invitations and envelopes. Check party supply stores for butterfly paper goods. If butterfly decor is not available, make your own; it will be more fun and is a good activity for kids. Use rubber stamps, stickers and bright-colored paper goods. Hang paper butterflies from the ceiling for indoor parties or from trees for outdoor parties (hanging will require adult help). Create butterfly napkins by folding large square napkins accordion style (1 inch back and forth), then sliding on a napkin ring and fanning open each side to look like wings. Flutter-By Activities - Choose only one or two of these activities (with one more for emergency backup) before kids fly away. Make paper butterflies (this is also a good indoor activity in case of uncooperative weather). Have butterfly shapes cut from construction paper ready for little hands to color, stamp, sticker or embellish with glue, beads, baubles and glitter. Decorate a butterfly house purchased at a craft, farm or garden store. Older kids can make a wooden butterfly house with extra adult supervision. Search home or garden stores for patterns. Have wood precut for easy assembly. Rent a video about butterflies, or borrow one from your local library. Plant a butterfly garden; check local extension service offices or garden stores for advice. Check out the Children's Butterfly Site at www.mesc.usgs.gov/butterfly/butterfly.html for more great ideas. Search for butterflies. Kids will need nets for this activity, as well as a spot that's full of butterflies. Expect this activity to last only a little while unless the catches are good. Provide a ventilated jar for catches. An outdoor game of butterfly tag can be especially fun. You may want to have life-size wings that kids can write their name on and decorate. Keep close supervision so no one flies too far away. Visit a butterfly conservancy or a natural history museum that has a collection. Check out the Internet for one near your area. Fly-Aways - Send the butterfly kids home with butterfly nets, packages of butterfly-attracting flower seeds to plant at home and butterfly stickers. The Mini Ham and Cheese Sandwiches make 18 appetizers, the perfect size and amount for kid-size finger sandwiches and kid-size appetites. Place 2 or 4 on a plate to form a butterfly, using a dill pickle for the butterfly body. Two sandwiches provide a side view of a butterfly in flight; 4 sandwiches offer a whole butterfly body view. A squirt of mustard, ketchup or mayo will add taste and butterfly designs. Cut baby carrots lengthwise in half to use for butterfly bodies. Cut zucchini slices in half; place halves next to carrot body. Refer to the cake diagram for making the veggie butterflies. 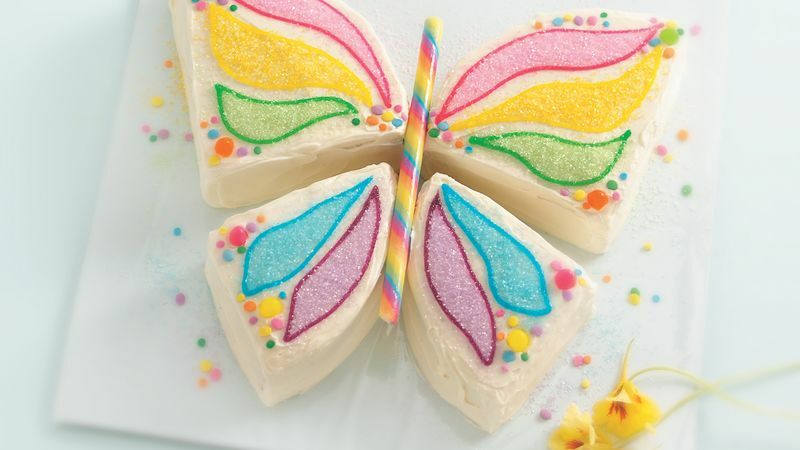 Make Butterfly Cake up to the last decorating stage, then turn kids loose with all the easy-to-apply decorations. Write butterfly names on slips of paper and place in a basket or butterfly net; let kids pick the butterfly name they will be called. Alphabetically (by their butterfly names), they can choose the piece of cake they want. Buy ice cream in a rectangular package; cut into slices and then into triangles to form butterfly bodies. Offer ice-cream syrups in squeeze bottles so kids can personalize their butterflies.